Even though the vegan challenge is over, you will probably still see some vegan recipes on the blog, like today’s post which can be made vegan by omitting the egg wash. Easy peasy. The thing I love about homemade bagels is that they have a nice crust (as bagels should!) unlike the packaged kind you find in stores. Optional: Various toppings… poppy seeds, sesame seeds, whatever you want! Add warm water to a mixing bowl and add sugar, whisking to dissolve. Sprinkle yeast on top of water and let sit 5-10 minutes. Meanwhile, whisk together flour and salt. Whisk yeast to dissolve it in the water and then add to flour mixture. 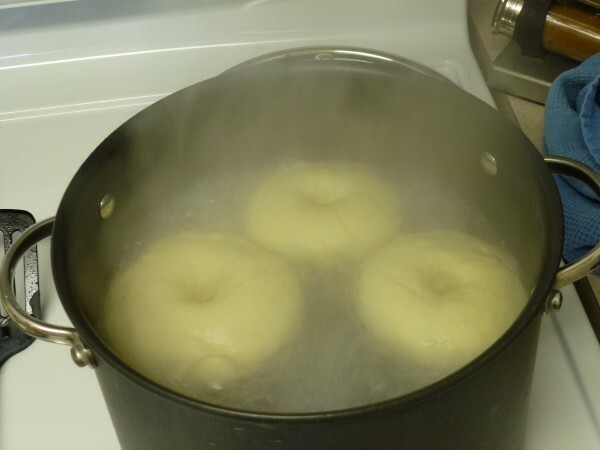 Begin to mix the dough, adding more water until it comes together to form a ball. Begin to knead the dough (it will be sticky at first) and continue kneading about 10 minutes. This dough will be dense, heavy, and fairly stiff. Punch down the dough and pinch off 8 sections. Roll each section into a ball, pinching together the dough on the bottom. Poke a hole in the middle of the ball, and create a bagel shape with your fingers. 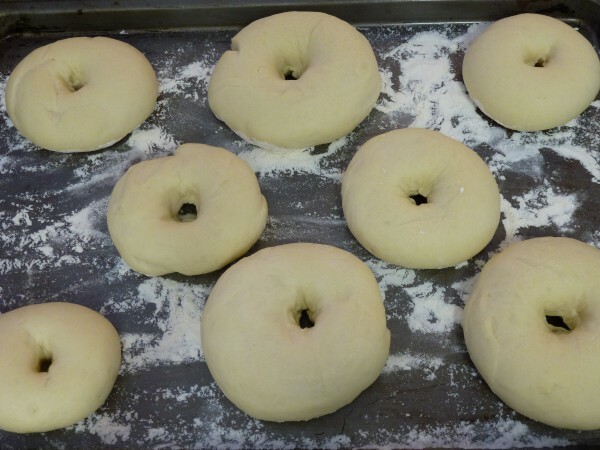 Transfer bagels to a floured surface and cover with a tea towel. Allow to rise for 30-60 min. Preheat oven to 375 F (190 C) and bring a large pot of water to a boil. If a darker, thicker crust is desired, add a tbsp. of baking soda to the water. Want to see the difference in crust colour between a bagel boiled in water with and without baking soda? You will also notice from the above photo that the bagels have a nice shine on them. This is partly due to the egg wash, but also due to the bagel being boiled in water before being baked. 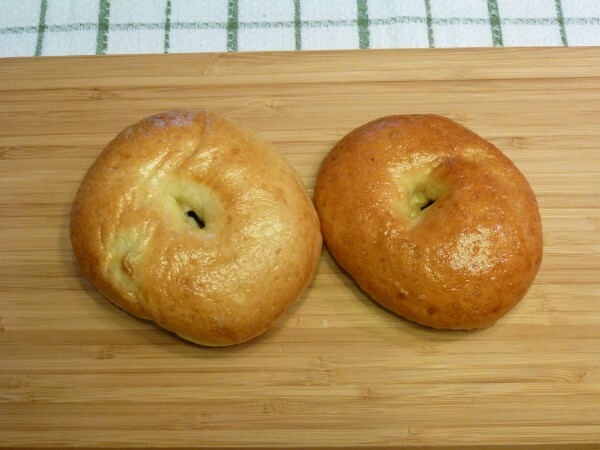 When bagels are boiled, the starch in the flour on the outside of the bagel gelatinizes. This creates an outer crust with a shiny look. This also helps explain why bagels are more dense than bread. Because the crust has already started forming before the bagels even go in the oven, the bagels don’t rise very much, giving you that deliciously dense chewiness. I gobbled up the poppy seed bagels like nobody’s business. 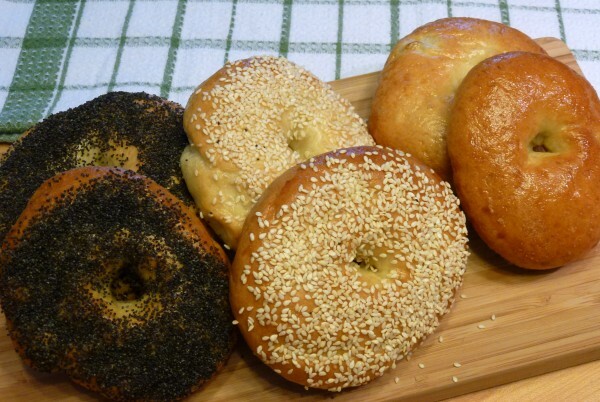 Which type of bagel is your fave?